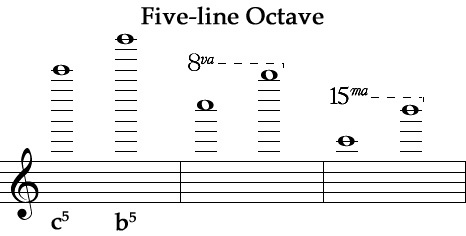 Under the Helmholtz Octave Designation System, a name applied to the octave which extends from c5 in the third octave above the treble clef staff to b5 in the fourth octave above the treble clef staff. The notes are indicated by lowercase letters with the superscript "5" (c5, d5, e5, f5, g5, a5, and b5). This octave can also be designated with five hash marks (e.g. c''''') or in the 8th octave with Scientific Pitch Notation (SPN) using uppercase letters with octave "8" (C8, D8, E8, F8, G8, A8, and B8). This is also known as American Standard Pitch Notation (ASPN) and was defined by the Acoustical Society of America. The MIDI Octave Designation System has two versions, one where note 1 (8.176 Hz) is octave "0" making the Five-line octave the ninth octave (e.g. C9), and the other with note 1 (8.176 Hz) at octave "-2" making the Five-line octave the seventh octave (e.g. C7).